The Fujitsu Lifebook P701 is the latest addition to Fujitsu's P-Series ultra-portable range and runs on an Intel Core i3 2301M processor. 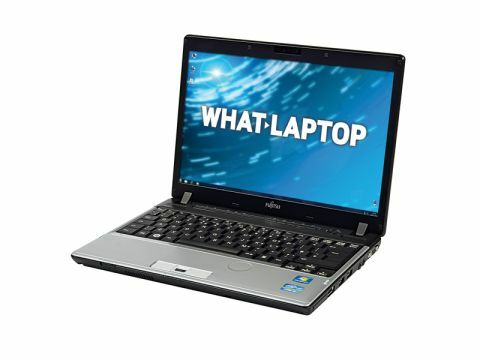 Aimed at the business user, the Lifebook P701 comes pre-loaded with Windows 7 Professional and Microsoft Office. A fingerprint scanner ensures your business documents remain private. The Lifebook P701 has an unassuming black and silver design that suits the office environment well. The 12.1-inch TFT screen has a matt finish, meaning no irritating reflections when working in bright light conditions. The smaller screen, low weight and briefcase-friendly dimensions (283 x 229 x 33mm) mean hours spent on the train can be put to good use. The compact keyboard might be a little cramped for anyone with large hands, but we found it only took a matter of minutes to get comfortable typing on it. Five small buttons sit above the keyboard between the speakers, controlling access to a variety of features, such as wireless networks, system diagnostics, power saving settings, Windows Mobility Centre and log off. The touchpad, marked out on the chassis by dimples on the palmrest, was comfortable to use and reassuringly responsive. The onboard Sandy Bridge technology, in the form of the Intel Core i3 processor, is supplemented by 2GB of RAM. Storage is impressive at 320GB, which will appeal to any business user who isn't quite sold on the idea of cloud computing just yet. Being an ultra-portable, the Fujitsu Lifebook P701 doesn't have an optical disc drive, so programs must be installed either through a flash drive or downloaded from the internet. Fujitsu has countered this by packing the P701 full of connectivity. The 802.1n wireless connection is the fastest currently available, and is supplemented by a Gigabit Ethernet port for a hardwire internet connection. Fujitsu has also packed in Bluetooth connectivity for adding remote devices or mobile phones. There are three USB ports for peripherals, an ExpressCard slot, a DisplayPort connector and VGA Out socket for hooking the laptop up to a secondary monitor. The Fujitsu Lifebook P701 performed well in our benchmark tests, with the standout result being the battery life of more than twice that of the average machine. When coupled with the robust design, this is a great choice for a business user. Fujitsu has focused on what a high-end user would want from an ultra-portable – great battery life, a comfortable keyboard and enough connectivity to provide a wealth of options. It won't take the crown from the likes of the Sony VAIO VPC-Z13M9E/B or the Apple MacBook Air, but at half the price, we're not complaining.